Lovely Helen. And delicious too! Perfect summer treat. I love cherry season. We haven't caught much of the World Cup, but hope to catch some games this weekend. Wow, inspiration! I'll be making this for dessert soon. No doubt this would get me some house points real quick! Can't wait to try the cherries with honey instead of sugar. This is just so cool and awesome. Love the first photo ... and the cherry photo on the dark surface works wonderfully. I love summer fruits (nothing like a fruit salad on a hot day), and today's recipe really makes them shine. A favorite of this summer for sure! And any summer, for that matters. So simple, yet so delicious. Now if I could only keep the hands off the cherries so I could make dessert!! Bought my second quart of cherries today! I'm going to try to perhaps bake something with these, instead of eating them straight out of hand like the last quart. Thanks for the amazing photos and inspiration! Have fun with the World Cup! Could there be a better combination? Delicious. Kris: I have one too. I don't use it. I like to cut the cherries in half for 90% of the desserts I make with them and when I don't, I use a metal skewer or straw to push the pit through. So beautiful! We have a big bowl of cherries in the fridge that I've been meaning to do something with for days...this may just be the ticket. This truly is a perfect summer dessert. I love this time of year! Desserts definitely give me a pass or just a nice dinner at home. My hubs would much prefer to eat in these days. Beautiful photos. great combination of tastes i love this thanks! Peaches on the grill are just so good. I've been experimenting with them a lot this season, on skewers, on pizza. This simple preparation looks lovely! This is a perfect and simple summery dessert. Sometimes the simple things are the best. It is perfect for throwing together when you have guests too. I love grilled fruits with ice cream - so delicious. Hum! Moi qui ai des envies de glace en ce moment (et de soleil aussi)!! these look amazing, and I am sure they taste so too! Love the grilled peaches, mmmmm! it all just looks so gorgeous. 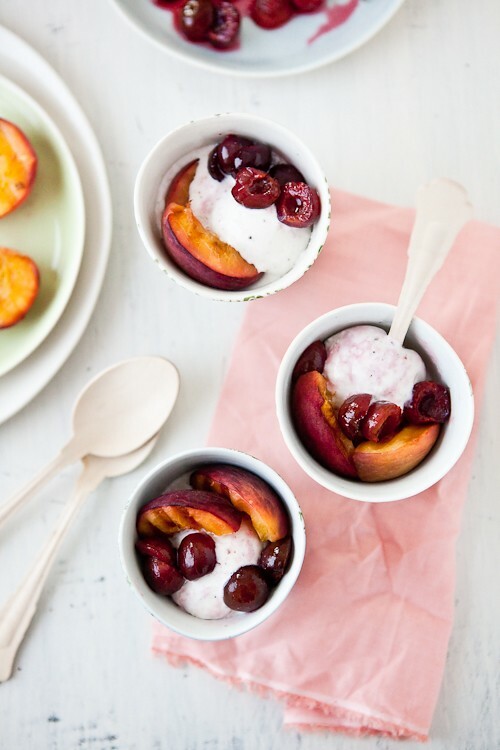 If summer actually decided to come to Colorado this year, these would be a perfect outdoor barbecue dessert...I love, love, love grilled peaches. I've done something similar with grilled peaches and raspberries and grilled poundcake. So yummy. But since today is 50 maybe and heat is on...think I'll save this for winter when I'm assuming summer will finally be here...brrr!! Sounds like a perfect way to celebrate summer, the world cup, and gain house points :) Mine generally involves chocolate cake - the fiance's a sucker for simple chocolate cake. Looks delicious. And so pretty! I have yet to grill fruit, but after reading this post, I'm going to try it. I was in the Provence earlier this year, and a very kind local was telling me of the sweet plump cerises grown in the region. Someday I'm going to return just for the summer fruits. When the fruit is fresh, the simpler the better. This looks absolutely delicious. Lovely, just lovely... What a perfect way to show off the fruit. Absolutely stunning. Any kind of tart and especially homemade ice cream gets me "house points". I know what you mean about the World Cup. Every other year my interest in sports rests only on by boys playing fútbol (soccer). I am completely ignorant about American football, basketball and baseball. I can't even understand the rules! However, having been born and raised in Argentina, every World Cup I turn into an avid sports fan nervously watching games and yelling into the television. My family thinks this is hilarious! Thank you for your beautiful food and photos. My 18 year-old daughter and I always seek inspiration from your website and it has fueled my daughter's interest so that she has started baking madeleines, cakes and tarts for a local farmer's market! Thank you for your creative and lovely ideas! 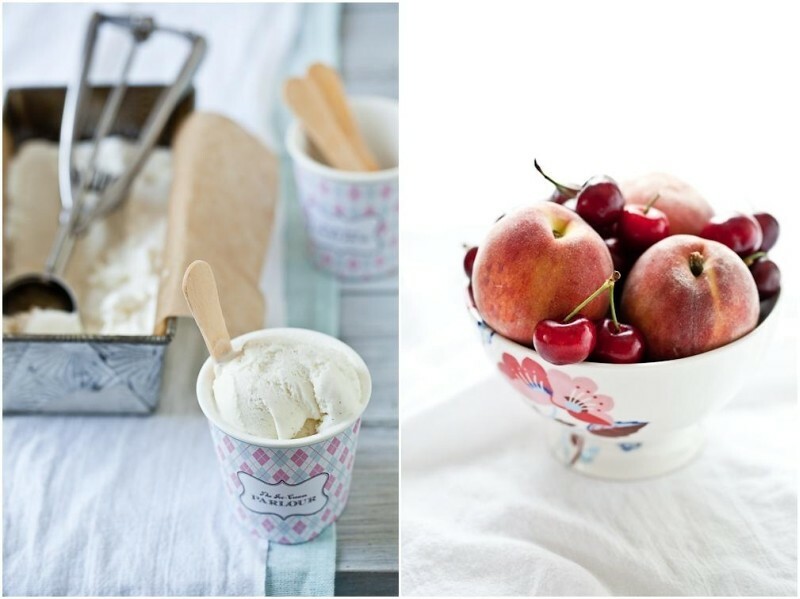 There is no fruit that doesn't go well with vanilla ice cream, I think. I love this combination, though. Very creative - and pleasing to the eye! We are glued to the TV for the World Cup right now and watch the Tour de France every morning in July (we go through withdrawals when it's over). Your family Sundays sound like the ideal day to me - relaxing, eating, watching sports, and spending time with family and friends. This pretty dessert would fit very nicely into that plan. Helen, I love each and every flavor you put together here - wonderful! 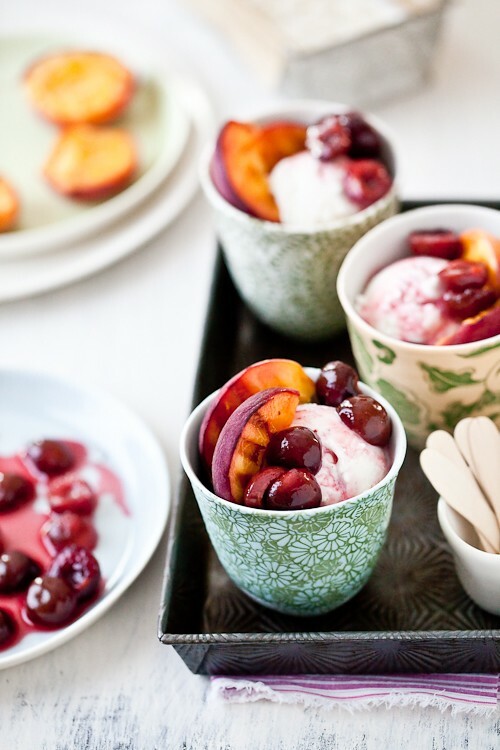 Peaches and ice cream are a perfect combination. I grew up with the two. Now add the cherries and that is even better! For me, this is a perfect dessert. I like my food as whole as possible. Vanilla ice cream may be my favorite food of all, certainly my fav dessert. Simple and whole is always so beautiful. Wow. Lovely photos and the dessert looks amazing. 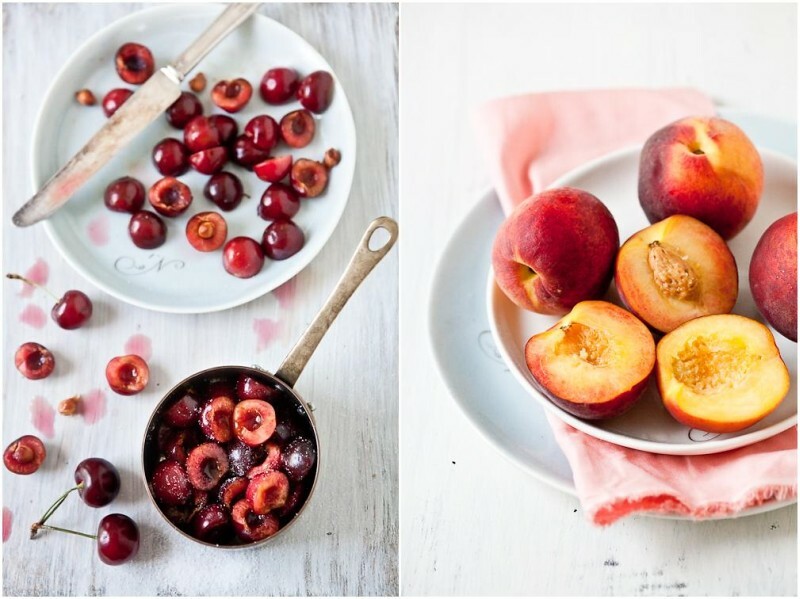 I love grilled peaches and cherries and so beautiful. This seems like a beautiful explosive flavour combination but at the same time so simple. Perfect! What a perfect summer dessert! I have an appetizer recipe that involves grilling peaches and I love how they taste grilled. I can't wait to try this recipe. Absolutely beautiful! I'm quite addicted to stone fruits these days, but haven't gotten around to doing much more to them than a quick wash before eating! But I do love a good grilled peach . . . It's so hot and humid here in Richmond, what I would give for such a gorgeous spread. Beautiful composition as always! This is perfect for summer! I like this so much! I can't wait to try this. Les pêches grillées me plaisent beaucoup comme accompagnement. 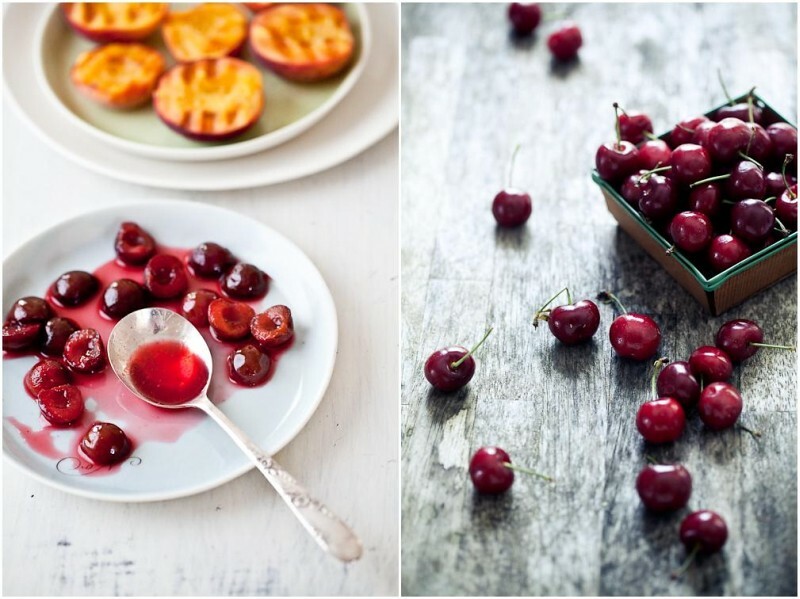 I just love the colors of summer fruits... YUM! I do not have a sweet tooth but you have a way of unlocking that part of me with your creations. I would love to eat this. Although we are approaching winter here in the tropics this looks incredibly appealing. Can't wait for the summer fruits to appear again! beautiful website, I love it found you through "From Me to You," so glad I did! Is there anything better than grilled fruit? I just happened upon your blog from comments from Elana's Pantry. Your pictures are stunning and really give me inspiration for something to strive for with my food photography (definitely a beginner in this area). I'm excited to now be following another beautiful blog. VoondaBar! i cannt wait to try this! yum!